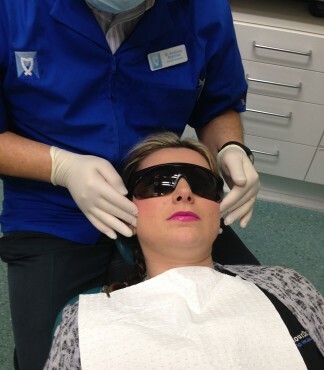 The detection and adjustment of minor irregularities and traumatic tooth contacts. This is usually detected by finding bruxofacets. 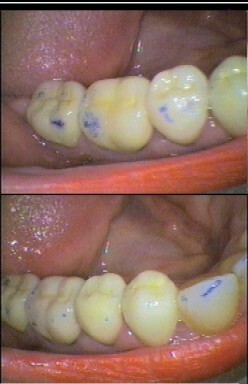 Bruxofacets are flat areas on teeth that are created by excessive grinding. This can restrict the jaw’s freedom to move over the teeth and can be a site of stress concentration. Sometimes the gradually movement of teeth as a result of changes, such as a loss of a tooth or wear, can cause “supracontacts”. This is where the upper and lower teeth meet at this point first and causes the opposing teeth not to meet evenly. The jaw tries to grind away this contact that is in the way, and may lead to excessive muscle activity and jaw joint dysfunction. Very thin marking paper, called articulating paper, can highlight the contacts of the teeth and an adjustment may be made to allow a more even bite or allow the jaw to move more freely. Occlusal assessment: Analysing tooth contacts in different jaw positions, abnormal function, depth of bite, tongue posture and speech. Within the mouth (such as those within the cheek or on the lower jaw). Outside the mouth (such as the temple area, on the cheek bone and lower jaw). Neck muscles (front and back of neck). Measuring the amount of opening of the jaw and the various movements of the jaw and neck. Joint assessment: This includes feeling the joint area for pain and listening for various sounds during movements. These sounds can indicate problems in the joint space between the jaw bones. 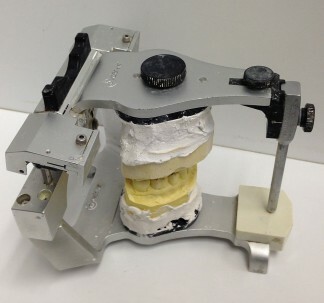 This item involves the accurate recording the contacts of a patient’s bite and the transfer of this to models of their upper and lower teeth to be placed on an adjustable articulator. The articulator represents the patient’s upper and lower jaws relationship to each other.